Located directly along the Mississippi River, Greenville is an historic city with a vibrant community and rich cultural heritage. Known as the “Queen City of the Mississippi Delta,” Greenville was once regarded as the most cosmopolitan and open-minded city in the state, with significant Italian, Chinese, and Jewish populations. The city was a bustling commercial center for the Mississippi Delta and the large cotton farms that dominated the region’s economy. Greenville, which serves as the county seat of Washington County, was named for Nathaniel Greene, a friend of President George Washington. In his memoir, Where I was Born and Raised (1948), Greenville native David Cohn traces his town’s roots back to the early 1800s, when settlers began arriving to take advantage of the rich soil and easy access to the Mississippi River, which was ideal for taking their crops to market. A post office was established there on September 10, 1803. From early on, Greenville’s Jewish population made significant contributions to the town’s progress. Former Greenville mayor Pat Dunne observed, “From cobbler to banker, merchant to plantation owner, the Jewish people helped to build a magnificent city here.” For much of the 20th century, Greenville had the largest Jewish population in Mississippi, with the most concentrated population of Jewish merchants in the state as well, though in recent decades the community has declined along with the Delta itself. Greenville’s status as the primary port city in the most fertile cotton-growing region in the country attracted growing numbers of Jewish merchants in the 19th century. In 1870, there were approximately 25-30 Jewish families who lived within Greenville’s borders. While earlier settlers came from Germanic countries, Russian Jews started to make their way to Greenville in the 1870s. Jews worked directly in the cotton trade, some as factory owners and others as plantation owners. Many early members of the Greenville Jewish community came to own large farms. Jewish businessmen saw opportunity in the Delta town. Morris Weiss, one of the earliest Jews in Greenville, opened the first Jewish-owned business in 1864. Weiss was born in Prussia, and first landed in New York City. He later went to New Orleans, and from there, peddled his way up to Greenville. Peddling clothes and various household items to both blacks and poor whites was often the first step in establishing a mercantile business. Like many Southern Jewish peddlers, Weiss finally saved enough money to open a store. 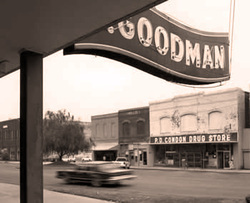 In order to expand the success of his dry goods store, Weiss hired Nathan Goldstein, who eventually married Weiss’s daughter, Emaline. Life was grueling for all Greenville citizens. A wandering river, powerful annual floods, and widespread diseases made existence somewhat precarious. Since its destruction during the siege of Vicksburg in 1863, the original Greenville settlement has rested beneath the Mississippi River. Though their loss of life and property was great, Greenville citizens were quick to rebuild. They rebuilt Greenville on the highest point between Vicksburg and Memphis, using donated property belonging to Mrs. Harriet Blanton Theobald. The “Mother of Greenville” donated land for schools, churches and public buildings, and the town was fully incorporated on June 24, 1870. In 1874, the citizens of Greenville suffered another city-wide catastrophe: the Great Fire of 1874, which destroyed 45 homes and 62 businesses, reducing the population of 890 to about 500. Despite warnings of fire hazards, wood had been used as the major material for the post-Civil War renovation. Twenty-five of the lost businesses were Jewish-owned. To make matters worse, the Jewish businesses had little or no insurance, leaving the store owners with no means to start over. Despite this great loss, Greenville recovered and continued to grow. Upon the death of Morris Weiss, his widow Hannah Weiss stepped up to run her late husband’s business, along with her son-in-law, Nathan Goldstein. The strong-willed, intelligent and eccentric woman was influential in keeping the family close, with many of her children remaining in her home even after they were married. A strict disciplinarian, she effectively became the family matriarch, asserting her influence over many Jewish families, including the Witkowskys, Witts, Brills, Hirsches, and Moyses, all of whom married into her family. Her great - granddaughter recalled, “no one in the family dared touch her paper until she had read it through thoroughly.” Queen Victoria was Weiss’s heroine. Not only was the Weiss home built in a Victorian style, but Weiss also copied the Queen’s china and lace patterns for her ornate home. Despite her strict demeanor, Weiss was essential to business and community endeavors. Her efforts yielded not only a large, tightly knit family and a successful dry goods store, but also significant funding for the nascent Jewish congregation in Greenville. Nathan Goldstein also displayed the ingenuity and resourcefulness that marked the Jewish population of Greenville. Despite his upbringing in a Jewish orphanage in New Orleans, Goldstein was an entrepreneur from an early age. By the time he was fourteen, he peddled goods in the French Quarter in order to provide for his poor immigrant mother and his sister Sara. He arrived in Greenville in 1868. After going into business with Weiss, Goldstein served as an important political figure in the community. Greenville expanded throughout the 1800s, boasting approximately 2,000 residents by 1878. That same year, Greenville encountered tragedy and loss once again when an epidemic of yellow fever killed one-third of the population. Eighteen Jewish residents were among the casualties. Doctors did not know how to address the problem, recommending such treatment as reduced bathing, brandy drinking, and the wearing of woolen socks for the viral disease. The brutal legacy of the 1878 yellow fever epidemic provides not only another sad chapter in the town’s history, but also yields insight into the racial and religious structures that existed within the society of Greenville at that time. In order to deal with the massive loss of life, Mrs. Harriet Blanton Theobold, who had earlier donated land for the town to rebuild after the fire, donated a large tract of her estate as a cemetery. The land was divided into three sections: one for African Americans, one for whites, and the third for Jews. Not knowing how to classify the few Chinese people who died in the outbreak, it was decided to bury them in the Jewish section of the makeshift cemetery. Many other Jews established businesses during this time. The Henry Scott family came in 1867 and established two saloons named The Cotton Exchange and Scott’s East End Saloon. Scott served as the agent for the Pabst Milwaukee Brewing Company. Louis Waldauer moved to Greenville in 1873 and founded a business with Nathan Erlich in 1886. Eventually, Waldauer sold that business and founded the Waldauer Cotton Company and owned a farm at O’Reilly in Bolivar County. Waldauer employed and rented homes to many African Americans in Greenville. He apprenticed African American Jim Bivens to be a cotton classer. Waldauer’s son, Ernest Waldauer, fought to get one of his father’s former employees an increase in his pension from his service in the Union army. Jewish merchants owned a variety of different businesses in Greenville. I.B Isenberg was an innkeeper and merchant. He also built one of the largest ice factories in the state, distributing its product to many Delta towns. Willie Elkas owned one of the first pictures shows, in the days of one-reelers and five-cent admission. Elkas also became one of the largest plantation owners of Washington County. Leon Fletcher purchased and ran the Rosylon Hotel, which had the reputation of being the finest hotel between Memphis and New Orleans. It was said that its dining room “was the delight of gourmets far and wide.” C.L. Schlom started a jewelry business in 1908, becoming Greenville’s leading jeweler. Irvin Sachs, who married Mr. Scholm’s daughter Zelda, continued to run the store. Though committed to commerce, their true passion was philanthropy. Mr. and Mrs. Sachs were also very active in their Jewish community: Zelda ran the synagogue’s library for 20 years. One very innovative businessman was Joe Weinberg. His store, The Leader, was the originator of “One Price to All” in the Delta. Every article was marked in plain figures, thus enabling the customer to see the price of every item he wished to purchase. He also offered refunds to unsatisfied customers. Weinberg owned the first automobile in Greenville. Weinberg was committed to improving his community, using his store as s source of supply for the budding scout movement and giving his personal endorsement for loans to individuals that might have been refused by the bank. Another Greenville native, Herbert H. Hirch, sold fresh and native Kansas meats in his market, which was considered the most up-to-date in the state. His son was Dr. Jerome Hirsch, the first Jewish physician in the city. At the turn of the century, there were three large Jewish-owned department stores in town: Leyser & Co., Hafter’s, and Nelms & Blum. In 1907, it was said of Nelms & Blum: “…the only store in Greenville handling exclusively ladies’ and children’s goods, and making a specialty of these lines, enables them to show a most attractive stock.” Perhaps the most notable Jewish store was opened by Sam Stein in 1908. Stein came to New York from Russia in 1905 and eventually settled in Greenville. He too started as a traveling peddler selling merchandise to farmers throughout the Mississippi Delta. While traveling to Vicksburg, two men jumped Stein, shot him in the arm, and stole his merchandise. After months of recovery, he started selling jewelry in front of Finlay’s Drug Store in Greenville. With the help of local investors impressed by his enthusiasm and business acumen, he opened his clothing store in downtown Greenville on Walnut Street in 1908. Several years after opening his store, Sam Stein married Fannie Aarenzon, whose father, Aaron, operated a shoe store in nearby Greenwood. Stein’s innovative business approach brought about quick and lasting success. While other Jewish merchants in Greenville catered to a high-end clientele, Stein’s store, then known simply as “Sam Stein,” remained focused on the type of customers Sam had peddled to previously, offering affordable merchandise primarily to blacks and less-affluent whites. 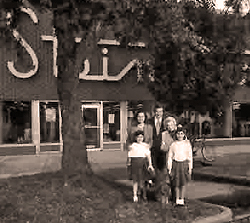 Stein’s four children, Jake, Joseph, Sadie and Bernard and their spouses, helped to grow the store. The Steins held prominent positions within the Greenville community. Jake Stein served on the Greenville City Council and was president of the Chamber of Commerce, the Kiwanis Club and the Greenville Bucks, Greenville’s minor league baseball team. Jake Stein’s wife, Freda, appeared in a number of Little Theater Productions. After attending New York University’s retail sales program in the early 1960s, Jay Stein was able to open up a second store in Memphis, adding new stores as the years progressed. From these humble beginnings in Greenville, Stein Mart has grown into a large, publicly-traded retail chain, with stores across the country. Jews enjoyed tremendous acceptance and opportunities in Greenville. Leopold Wilczinski served as the first elected mayor of Greenville in 1875. The Wilczinski family were employed as cotton brokers and general merchants. Wilczinski was also president of the Washington County Board of Supervisors. Jacob Alexander served as mayor of Greenville in the late 19th century. Theodore Pohl also held many local offices. Theo Pohl had operated a wholesale liquor house on Washington Avenue and was a prominent member of the Cotton Pickers, the then famous Elks Lodge of Greenville, and served a term as its Exalted Ruler. During the Yellow Fever outbreak of 1878, much of Greenville’s population fled the city. Only three elected officials remained in the city during the outbreak, two of whom were Nathan Goldstein and Theodore Pohl. Greenville Jews served as soldiers in several wars. Edward Storm was one of the first volunteers in the 28th Mississippi Cavalry Regiment during the Civil War. He was wounded twice, captured in Atlanta, and spent the winter of 1864-65 in Camp Douglas prison camp in Illinois. He was paroled and exchanged, but captured again at Columbus, Georgia. Due to his efforts, he emerged from the war with the rank of colonel. He became a prominent planter and merchant, and was elected Chair of the Board of Supervisors of Bolivar County during Reconstruction. He later served as Postmaster of Beniot. He married Julia Kuhn of Greenville in 1880 and had five daughters. Benjamen Kossman moved to Mississippi in 1896 as a traveling salesmen. In 1898, his army unit was brigaded with Lieutenant Colonel Teddy Roosevelt during the Spanish-American War. He fought at San Juan Hill in July 1896. He left the army in 1902 and moved to Greenville to raise a family. Greenville Jews worshiped together during the 1870s. Rabbi Charles Rawitzer of Memphis officiated on religious holidays from 1871-1879, but it was not until 1880 that they officially chartered their congregation as the Hebrew Union Congregation. In 1871, Greenville Jews formed a local chapter of the B’nai B’rith. By 1877, they had a second chapter in town. That same year, local Jews formed a Young Men’s Hebrew Benevolent Society with 23 charter members. In 1906, the Greenville Jewish community dedicated their new building, an impressive replica of the Natchez temple. The Greenville temple served Jews throughout the small towns of the Delta. Despite strong pressure to observe the discriminatory and segregationist norms of the Jim Crow South, some Greenville Jews gained a reputation for dealing fairly with the African American community. In the first few decades of the 20th century, William Percy’s father, Senator LeRoy Percy (owner of the Greenville Cotton Compress), partnered with Morris Rosenstock to give out loans to local African American sharecroppers at a time when many Africans Americans were disenfranchised, lynched and chased off their land. Rosenstock was a prominent planter in the county before he moved to Greenville in 1905. Rosenstock gave close to $150,000 to Greenville residents at an interest rate of 6 percent, which would have been considered quite low at that time. Percy and Rosenstock saw to it that they received loans for mortgages to buy farms in the Delta in order to maintain a steady supply of labor for the region. Although their motivations derived from a marked sense of “noblesse oblige,” their actions allowed for a thriving African American community. Indeed, Washington County had African American policemen, judges and mailmen, and the best schools for African Americans in the state. Several black doctors and dentists had offices in two buildings on the edge of downtown. To help maintain this community of workers and keep a spirit of religious toleration in the town, LeRoy Percy successfully mitigated the influence of the Ku Klux Klan in Washington County throughout the 1920s. The recession of 1920 represented the beginning of two decades of economic hardship for a cotton industry in decline because of falling prices, overproduction, and the spreading of boll-weevil infestations. By 1927, Greenville had a population of 375 Jews, but hard times continued to plague the community. Every few years, the Mississippi River would give them trouble, but not until 1927 did it deal a truly significant blow. The Great Mississippi Flood of 1927 was the most destructive flood in United States history. The most severe flooding occurred on April 21, 1927, when the Mounds Landing levee, located 12 miles north of Greenville, broke, releasing more than double the volume of Niagara Falls. The entire town was submerged. With Greenville inundated, black and white residents alike fled to the high ground of the levee. Over the next ten days, one million acres of land across the Mississippi Delta region were immersed under water at least 10 feet deep. In the end, around 240 people died, and 2,200 buildings washed away. Lillie Johl Waldauer, who died two days before the levee broke, could not be interred until the water subsided months later. Her son, Ernest Waldauer, stayed behind and helped out with relief efforts. Other Greenville Jews served as Red Cross Volunteers, including Ruth Blum, Alberta Lake, and Ben Wasson. Washington County was the hardest county hit. The flood displaced tens of thousands of people, and property damage was estimated at $350 million, equivalent to approximately $5 billion today. While whites were eventually evacuated, local planters like LeRoy Percy, afraid of losing their labor force, refused to let thousands of African Americans evacuate on steamboats up the river. They were forced at gunpoint to work reinforcing the levees while suffering near starvation in the camps. The flood served as a major catalyst for the African American migration from the South to northern cities like Chicago. Within a year, fifty percent of the Delta's black population had departed. While the Jewish community survived the flood, they faced the flood’s economic aftermath along with the devastating economic fallout from the Great Depression. As a result, many businesses, including Jewish ones, closed or had to take out risky loans. Despite the setbacks from the flood and the Great Depression, by 1937, 450 Jews lived in the city, constituting a significant part of Greenville’s merchant class. Jake Stein served as president of the Chamber of Commerce starting in 1950, and also served as a city councilman. Jews also joined the professional ranks as doctors and lawyers. Eugene Bored, son of the first Rabbi of Hebrew Union Temple, was the first Jewish lawyer in Greenville, and David Strauss soon followed. Other Jews worked in a variety of professions including education, architecture, management, postal service, and beverage distribution. Jewish women worked as nurses, retail clerks, store managers, and journalists. One Jewish Greenville resident had a Ph.D. in entomology and worked for an agricultural experimental station. Fred V. Davidow was the first Greenville native to become a rabbi, starting his career in Plattsburgh, New York. As the 20th century progressed, Jews continued to participate heavily in the community and culture of Greenville. Greenville’s Jewish population reached its peak in 1968, with to 700 Jews residing in the town. Greenville’s economy remained strong as city leaders were able to attract manufacturers from the North. At the same time, local riverboat families developed a booming towboat industry that expanded the town into one of the principle ports on the lower Mississippi river. Jews were members of communal organizations, like the Elks Club, and also went to great lengths to do interfaith outreach. During the 1950s and ‘60s, Hebrew Union Temple would hold symposiums for the larger community and hosted a program entitled “Adventure in Judaism” on the local radio station to educate their non-Jewish neighbors about their Jewish faith. Rabbi Abraham Ruderman’s wife even published Jewish recipes in the local paper before holidays. The temple would also host groups at services, such as the Boy Scouts. On several occasions, the temple partnered with the local Methodist and Episcopal churches, hosting joint services and doing pulpit swaps. This spirit of tolerance would continue throughout 20th century. For instance, when incumbent city councilman Jake Markuson's opponent, Mr. Biggers, posted an anti-Semitic campaign flier in 1962, the town rallied behind Markuson, and he won by a landslide victory. Greenville Jews were also heavily involved in education. In addition to serving on the local school board, some Jews served as public school teachers. One of Greenville’s junior high schools was named after Herman Solomon, who taught and held administrative positions in Greenville public schools for 45 years. A graduate of the University of Chicago, he was persuaded to return to Greenville as an educator. He also served as an officer and religious school teacher at the Temple. Solomon published children’s books and local histories, along with poetry. Solomon stayed two years past his retirement to handle the integration of the high school he was principal of from 1965-1967. His daugther Joan was named Queen of the University of Illinois. Another Greenville Jew, Ed Bogan, served as chairman of the school board throughout the 1950s. In addition to being well-integrated into the Greenville community, the Jewish community actively became a part of the Southern culture, particularly in sports. Solly Cohen, from nearby Anguilla, a member of the Hebrew Union Congregation, was awarded the Norris Trophy in 1928 proclaiming him the best all-around athlete at the University of Mississippi. He played fullback for the Rebels and was a baseball and track star. He went onto become a successful science teacher and college and high school coach. Earl Solomon Jr. played for the Ole Miss Rebels and served as president of Hillel. He married Ms. Nathalie Goldstein, and their daughter, Kitty Solomon, served as Greenville Homecoming Queen from 1960-61. Benjy Nelken, whose family ran The Fair General Store for more than 90 years, received an athletic scholarship to the University of Mississippi in 1963. Greenville had its share of Northern transplants as well. Although he grew up in Winnipeg, Manitoba, Dan Guravich choose to live most of his life in Greenville. After earning a Ph.D. in botany at the University of Wisconsin in 1949, Guravich took an agricultural research job in Greenville. Just three years later, he abandoned his scientific career in favor of the uncertain life of a freelance photographer. He opened a camera store in Greenville and went on to become a nationally-acclaimed and prolific polar bear photographer, taking over 40,000 photographs. During the civil rights era, members of the community were torn between support for the "Southern way of life" they had embraced and the values of their Judaism. The Southern Jewish historical experience in the civil rights era was complicated and deeply nuanced; in many areas of the South, Jews tried to keep a low profile while attempting to assimilate into white Southern society. While many Southern Jews were sympathetic to the goals of the Civil Rights Movement, relatively few took a public stand on the issue. To challenge the system was to lose acceptance from the majority of white Christians, which had serious social and economic consequences. The Brown v. Board of Education Supreme Court decision, which ruled segregated schools unconstitutional, focused unwanted attention on Southern Jews because of the prominent role that Northern Jews played in the Civil Rights Movement. Organizations like the White Citizens Council—founded in Indianola in July 1954—used threats of economic boycotts to keep businesses and other areas of Greenville segregated. In 1963, when the Union of American Hebrew Congregations, the national organization of Reform Judaism, invited the Reverend Dr. Martin Luther King, Jr., to speak at its biennial convention, members of the Greenville congregation wrote a letter to the Union protesting the invitation. Congregation President Bernard Goodman wrote that such outward support of civil rights would endanger the acceptance Jews had long enjoyed in Greenville, and that no organization had the right to speak for the Jews of America as a whole. The congregation board voted to stay neutral on the issue of civil rights. This letter reflects the unique position of southern Jews, showing that on some issues, they had more in common with white, Christians southerners than northern Jews. Greenville was in the heart of the Delta, where towns such as Greenwood and Cleveland became synonymous with violence and brutality during the struggle for civil rights. While racial tensions did exist in Greenville, it avoided this fate. After the summer of 1964, the Delta Democratic Times referred to the summer as the “long cool summer.” In the late ‘60s, when other school districts in the Deep South were under federal desegregation orders, Greenville voluntarily integrated with an absence of the violence seen elsewhere. In some cases, Jews were able to serve as intermediaries during the struggle for civil rights, and sometimes played a quiet role in accommodating social change. When local newspaper editor Hodding Carter angered Greenville segregationists with his cautious support for racial justice, Jewish businessmen, including Jake Stein, continued to advertise in the paper despite others’ calls for a boycott. Joe Weinberg loaned Carter the money to buy out his partner in the paper, freeing him to express his own editorial opinions and challenge the status quo in Mississippi. For the next decade, he would use Greenville’s Delta Democratic Times to fight the White Citizens’ Council and advocate the need for tolerance and equal economic opportunities. According to Carter’s recollections, Jake Stein’s leadership proved critical during a heated meeting at the Hebrew Union Temple to discuss whether or not the synagogue should endorse the White Citizens Council. In the late 1960s, Hebrew Union’s Rabbi Abraham Ruderman, a northern-born rabbi, organized a nationwide drive to gather used clothing for Greenville’s impoverished African Americans. While he served in Greenville, he frequently delivered sermons at African American churches and worked hard to preserve the public school system in Washington County. Other examples of positive African American-Jewish relations involve personal relationships. Goldie Williams, an African American woman, was able to escape the often oppressive work of picking cotton when she was hired by Sidney Goodman, who owned a clothing store that prided itself on a policy of “treating people like people.” Goldie Williams recalls receiving an unheard of “thank you” for the first time at Goodman’s, as well as enjoying a workplace atmosphere of trust and mutual respect. The friendship between Sidney Goodman and Goldie Williams developed into a long-term sharing of troubles and joys that lasted more than four decades. Over time, the Jewish population in Greenville declined. The numbers began falling more sharply as economic opportunity withered in the Mississippi Delta. One by one, the manufacturing plants closed down. Many moved overseas, seeking cheap labor. Some relatively well-paid jobs were gained in the new riverboat casinos that dot the lakefront. By the mid-1980s, most of the family-owned stores that had been on Washington Avenue for years had gone out of business. The once vibrant downtown shopping district now had a surplus of vacant and abandoned store fronts. In 2008, only about 120 Jews lived in the Greenville area. What was for a long time the largest Jewish community in Mississippi has now followed the demographic trend of so many other small town communities in Mississippi. Today, the Greenville community is aging with no new generation growing to replace it. Despite this demographic reality, the Jews of Greenville still work to preserve their religious and cultural traditions. Services take place twice a month at Hebrew Union. Every October since 1987, Hebrew Union hosts an annual golf tournament, the Delta Jewish Open, attended by local Jews and non-Jews, as well as friends and family from across the country. In 2001, Greenville’s Hebrew Union Congregation commemorated its anniversary with a three-day celebration. Downtown Greenville has seen renewed interest and activity lately. Benjy Nelken played a major role in preserving local businesses as part of the Mississippi Main Street Association. He turned his private collection of Greenville and Delta memorabilia into the Goldstein, Nelken, and Solomon Hebrew Union Congregation Century of History Museum. The museum is housed in the library of Hebrew Union Temple. For his efforts, he received the Outstanding Citizen’s Award in 2004. The collection contains artifacts and pictures brought back by Greenville’s Richard Dattel, one of the first groups of officers who liberated Dachau, a death camp created by the Nazis to house Jewish prisoners. In addition to this, Nelken and other residents helped with renovations of Walnut Street, which fronts the levee, through a public/private partnership of local government and banks. The project was so successful it was named the Mississippi Main Street Public Improvement Project of the Year. ​Though small in number, Greenville Jews remain proud of their heritage. The Jews that remain there are committed to doing whatever is necessary to continue to make it a wonderful town in which to live and thrive. Special acknowledgement goes to Benjy Nelken and his "Century of History" museum housed at Hebrew Union Temple. Barry, John M. Rising Tide: The Great Mississippi Flood and How it Changed America. New York: Simon & Schuster, 1998. “Century of History Continues to grow.” The Delta Democratic Times. Sept. 16, 2001. Chapman, C. Stuart. Shelby Foote: A Writer's Life. Oxford: University of Mississippi Press, 2003). David Cohn, “I've Kept My Name.” The Atlantic Monthly. April 1948. Davidow, Fred. “A Remembrance of Greenville, Mississippi,” The Jewish Georgian. Jan. 1991. Ginzl, David J. Stein Mart: An American Story of Roots, Family, and Building a Greater Dream Tampa: The University of Tampa Press, 2004. “Greenville’s Hebrew Congregation Active.” The Clarion Ledger. March 2, 1985. “Hebrew Congregation Celebrates 90 years,” The Delta Democrat-Times. February 19, 1971. James, Susie. “Jewish matriarch patterned self after queen.” The Delta Democratic Times. Oct. 19, 1980. “Jewish Congregation.” The Delta Democratic Times. Oct. 22, 1980. “LeRoy Percy,” Fatal Flood. The American Experience: PBS. http://www.pbs.org/wgbh/americanexperience/films/flood/. Accessed May 19, 2015. Nelken, Benjy. Interview with Janet Bordelon. January 2015. Phillips, Robert L. Shelby Foote: Novelist and Historian. Oxford: University of Mississippi Press, 1992. Ruderman, David. “Greenville Diary: A Northern Rabbi Confronts the Deep South, 1966-1970.” The Jewish Quarterly Review, 94, no. 4. 2004. Solomon, H.W. The Early History of the Hebrew Union Congregation of Greenville, Mississippi. Greenville, Mississippi file. Institute of Southern Jewish Life archives. Waldauer, Ernest. Interview. April 20, 1977. Oral History Project / Washington Co. Library System. Williams, Terri. “Across the Divide the Issue: Joined in Struggle 30 Years Ago By the Civil Rights Movement, Jews and African Americans have since Drifted Apart,” The Virginian-Pilot Norfolk, VA. July 7, 1996. Wyatt-Brown, Bertram. The House of Percy: Honor, Melancholy, and Imagination in a Southern Family. Oxford: Oxford University Press, 1994.